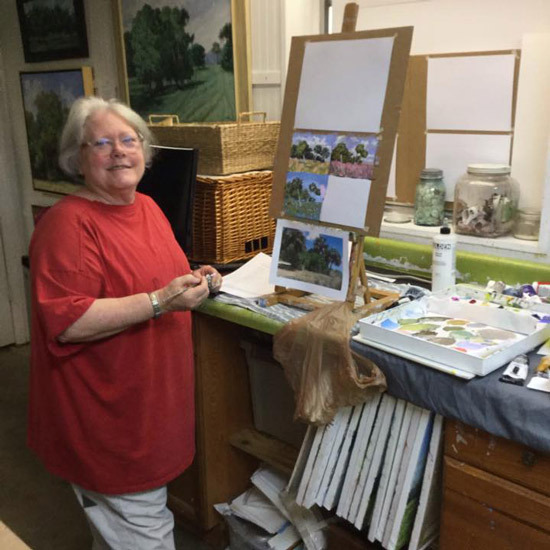 Most of the time Linda Blondheim paints the fields, woods, swamps and trees of rural agricultural lands on farms in north Florida - when she's not offering smart business tips. Right now she's evacuated from her field home and is hunkering down in her Paddiwhack town studio in Gainsville with her dog Henry, painting small bird paintings and hoping for the best. So I thought I'd write this post highlighting her work and her great art tips. 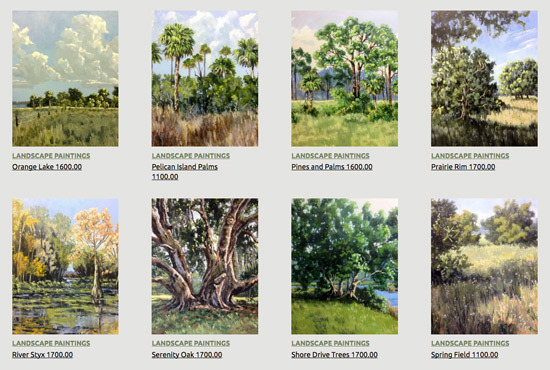 This is her website Linda Blondheim - Florida Landscape and Tree Paintings. I recommend you take a look at her landscape and trees on her website? Florida is my home, and I have painted and roamed the fields and woods here all of my life. I grew up around horses, cattle and dogs. Growing up in north rural Florida has given me a deep appreciation for agricultural land and trees. These subjects are the focus of my work. As our rural areas of Florida fall to development, I feel it is urgent to preserve these beautiful lands and scenes on canvas. Future generations will know how lovely natural Florida was during my tenure. I have a trail on my own land where my dog Henry and I walk every day. We enjoy the wild creatures who share the land with us. I’ve been a country painter most of my life and I love the culture and cuisine of this region. Many artists in Florida paint the tourist areas of Florida, offering massive numbers of reproductions. I only paint original paintings in oils and acrylics. My paintings are one of a kind and unique. I paint the natural world where my roots grow deep. This is her Linda Blondheim Art Notes blog - where you can enjoy reading about the reality of an artist's life. She talks about creating paintings and selling art. Lots of great stuff in there by a very experienced artist who has been making her living from making and selling art for a long time. Linda tells it like it is. I especially recommend reading her notes for all those who have romantic ideas about being an artist - Linda will provide you with the reality of what an artist's life is really like. Here's a few recent notes worth reading (plus you often get a free recipe at the end!). One of the hardest concepts to understand is how to really see. Objects do not look like we think they do. In my mind, I know what an elephant looks like but in reality, I have no idea. Think about ways that you can be unique among artists. What makes you just a bit different or makes you stand out from the pack. That is not necessarily about your art. It could be about the extra level of service you provide. Gift wrapping and shipping services for paintings, delivery and installation, framing consultation are all little extras which will impress future collectors. The easier you make life for them, the more likely they will be to choose you instead of your competitor. It is important to figure out what you will sell and how you will attract buyers. You must find a good location for your shop. Life is not like the film Field of Dreams. If you build it, they will NOT come unless you work very hard and market endlessly to get them there. You will need to either have a large marketing budget or be in a dandy location. If you must choose one, go with the great location if you can. I will continue to study and offer the best work that I can do. I am very willing to face the challenges of life as an artist because I know there are enough people who do value art to keep my career moving forward. Linda posted this post which is circulating amongst those living in Florida on her Facebook Personal page. PLEASE ALL NON-FLORIDIANS READ !!!! 1) Calling people who don't evacuate "idiots" or saying "they deserve what happens to them" is a judgement statement that without facts, you are not qualified to make. We live in a state that is not the 'Spring Breakers' idea you have in your mind. We have more 55 plus communities than you can imagine. Elderly who can't drive because of age, or leave because of finances. A lot of our elderly, don't have "blood family" so they are relying on their "God made" family. We aren't leaving our grandmas and grandpas behind alone to face Irma. They need younger people right now to make sure they have what they need to survive this storm and the devastation. Most of them have pets that are as old as they are. Just like your kids would be your priority, their furry companions are theirs. 3) Don't say "Get in your car and drive fast out"
Gas stations are getting fuel still, but that fuel is gone before the lines are empty. There is no driving fast. Cars are moving 5-7 mph on highways trying to get to safety. The lines are long and imagine, with a gas shortage, being stuck on highways in jams for 12-15 hours. 4) Florida has one way out, and that is through the top (Northern) part of the state. There are basically 2 major roads out. Those roads are jammed, backed up, and not expected to change. That main road is also through Georgia which is also being evacuated. 5) To post "Florida is about to be wiped off the map" because you are watching the news reports and panicking from 3,000 miles away- is not the most uplifting thing for us to see. Plus, don't speak your devastation to us. Be positive! 6) "If I lived in Florida, I would have evacuated a week ago." Well I'm not so sure that you would have. It's not that simple if you have a heart...not only that, you don't know until the final days which path the storm is going to take. Homes have to be boarded up. Things have to be done to ensure that if you do leave, you have somewhere to return. Then after our homes are secured, we again...have elderly who need their homes secured. So I'd say if you were here, you wouldn't leave so fast. Not to mention, you will still need your job. Life doesn't stop just because you leave. 7) "Go to a safer part of the state." Yes, we thought of that. No one knows exactly what part that is. If Irma takes a turn it could hit the west coast- if we are all fleeing to the west coast because it says the east coast is the most dangerous, then that could be costly. We know what we need to do and we are monitoring the situation. Feel Free to check on us, text us, call us. But, don't text your fears of our demise. Don't call us crying because you are scared for us. We have a storm to conquer. As warriors we need to be healthy, mentally and physically. **copied & pasted feel free to do the same. Thanks, Katherine, for spotlighting Linda. I can't think of any artist online more deserving.